While the campus has been quiet, the Tech women’s basketball team has been grinding away in preparation for the upcoming ACC competition that awaits them over the next few weeks. 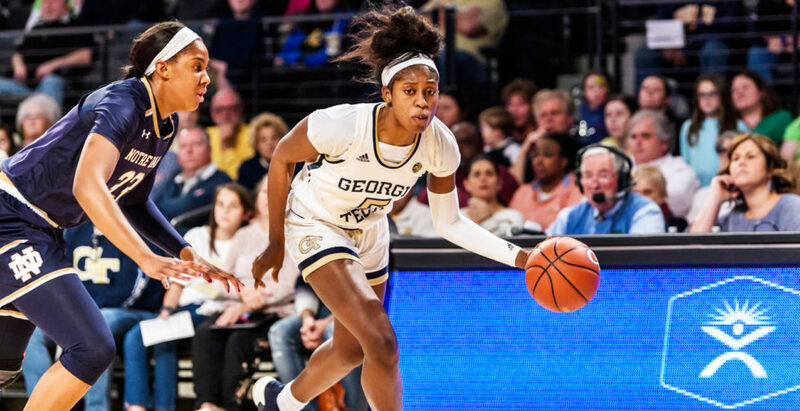 Led by freshman guard Elizabeth Balogun, who was named ACC Rookie of the Week twice earlier this season, the Jackets finished their non-conference season in the fall with wins over Appalachian State, Georgia State, Western Carolina and more. The team wrapped up the calendar year with a significant 81-40 win over Wofford, along with the West Palm Beach Invitational in which the Jackets won 84-73 over Seton Hall, but fell to Dayton, 85-66. Most notable of the non-conference wins was an upset over No. 14 Georgia, marking two consecutive victories in McCamish Pavilion over the school down the road. Early in the season, junior guard Francesca Pan recorded her one thousandth career point during a game against Idaho State, while head coach MaChelle Joseph achieved her 300th career win with Tech. With a top-10 recruiting class and a group of experienced upperclassmen, Joseph has an extremely talented team that will pursue a spot in the NCAA tournament, a feat the program has not secured since 2014. The first game of the ACC schedule resulted in a win for the Jackets over Boston College, bringing the team’s overall record to 11-3 at the time. The women held onto the early lead created by consecutive scores by Pan and sophomore forward Lorela Cubaj, resulting in a final score of 81-76. The game was highlighted by 55 rebounds and 17 out of 24 completed free throws, along with Balogun’s first collegiate double-double, a team-leading 18 points and 17 rebounds. The Eagles struggled to catch back up to the Jackets while adjusting to their new head coach and seven true freshmen. The Tech women hosted No. 2 Notre Dame, the defending national champion, as their first ACC competition of the season at home on Sunday. The Fighting Irish lead the series of games against the Jackets, 10-0. Last season, Pan, sophomore guard Kierra Fletcher and junior guard Chanin Scott all scored double-figures in South Bend, but Notre Dame broke away after a second-half tie to secure a win over the Jackets. Similar to last year, the Jackets posted double-figure scoring numbers led by Balogun with 14 points, freshman forward Elizabeth Dixon with 12 points and Pan with 10 points. Yet again, the Jackets lost after a torrid start that yielded an initial margin of 8-2. The Fighting Irish gained momentum and led 39-22 at halftime, thanks to an absolutely dismal second quarter by the Jackets. While the Jackets attempted to catch back up in the second half, their efforts were too little and too late. Despite this, the teams were nearly identical when it came to rebounding numbers, with Notre Dame leading only by a single rebound, 34-33. Tech shot 36.1 percent, while Notre Dame shot 54.8 percent, a statistic that alone show where the Fighting Irish gained an edge. Tech faces the Duke Blue Devils on Thursday, a game that will provide hefty competition alongside a home court advantage for the Jackets. Last year, the Jackets came up short against the Blue Devils with a final score of 77-59. Yet, the team put up a fight from the beginning as they led by four at the end of the first quarter, which was then surpassed by Duke by halftime to place the Jackets at an eight point deficit. The Blue Devils are coming off of a 63-51 loss to No. 9 North Carolina State and a 73-51 loss to No. 3 Louisville. The North Carolina State game allowed the Blue Devils to taste hints of victory as they came back from sizable deficits multiple times throughout the game, but did so to no avail. The Louisville game was led by the Cardinals from the beginning, something that the Blue Devils will attempt to stay away from as they enter into competition with the Jackets this week. If the Jackets can continue the success they saw during their non-conference schedule, the NCAA tournament could be in sight for a team that has not made an appearance in five years. The Duke women will most likely be fighting the Jackets for a spot in the NCAA tournament come later this season and will certainly be clawing for their first win of this season’s conference competition. The ACC schedule has the Jackets playing Louisville and Clemson on the road following the Duke game, along with home games against Syracuse, North Carolina State and North Carolina to close out the month of January. February brings another competition against Notre Dame, this time at South Bend, before hosting three more opponents and traveling to another four. Playing basketball in the ACC, men’s or women’s, is a steep challenge. And it may take more time for Tech’s young core of players to gel. But at this rate, the Jackets will be a worthy contender for a spot in the NCAA Tournament.